On the left: my old school ID badge, ca. 2006. On the right: me, last night. Looking at my badge photo, I can’t believe I was actually that big. Looking at my current photo, I can’t believe this is what I look like now. I have a neck. My face actually has a distinct shape. My cheekbones are actually more prominent than they have ever been. I’m getting used to this face, but it’s tough. I’ve never seen this version of my face before. For many years, I only saw the face on the left when I looked in the mirror. And even now, in my mind’s eye, I still see the face on the left because I have trouble reconciling that the face on the right is mine now. And I hope I never see the face on the left ever again. I refuse to behave in a manner that would have me looking at that face again every day. I am growing to love the face on the right. I want to see her every day when I look in the mirror. I want this to be the face the world sees when I go out and about. This is the face I want the world to know now. Now the face on the right needs a haircut, and soon. It’s been far too long! Today’s eating was good. I was on the low side of my protein goal today at 81 grams. I got in 42 grams of carbs and 32 grams of fat, with 812 calories. I drank 112 ounces of water and walked a little over 3 miles today. Tomorrow is gym day, so my carbs will be a little higher as the plan is to bike for another 45 minutes and then do an upper body workout. Breakfast and lunch are already taken care of, and we are doing dinner out tomorrow night with my family. Since I know where we’re going, I’ve got my meal picked out already and will be good to go. 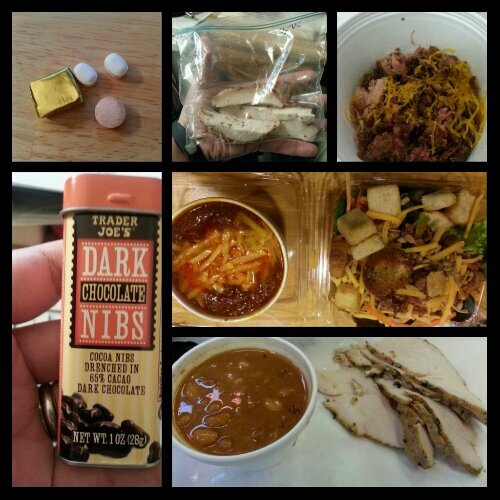 Today’s food choices, from upper right: Rudy’s ham, bacon and cheese breakfast bowl; Central Market chile con carne with cheese and mixed green salad with cheese, carrots, croutons and bacon; Rudy’s smoked turkey and pinto beans; Trader Joe’s dark chocolate nibs; multivitamin and calcium supplements , iron supplement. 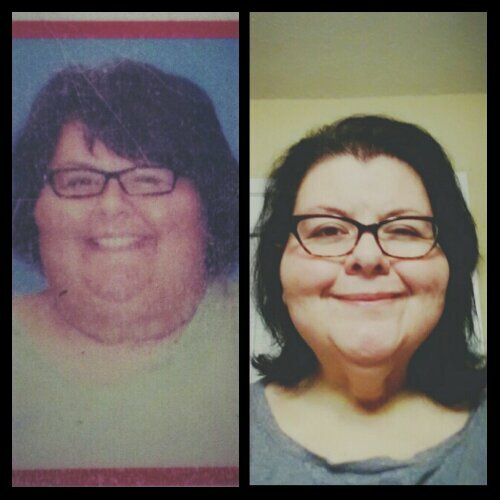 This entry was posted in being thankful, daily bites, eating, head trips, la guerra, post-op, self-image, the sleeve, vsg, weight loss surgery and tagged benefits of wls, daily bites, eating, head trip, photo post, planning for success, post-op eating, post-op life, reflections, self-image, the little things, the sleeve, VSG, vsg realness, WLS. Bookmark the permalink.